The change in agricultural sector such as migration of rural labor to urban areas, price hike of wage rate during peak period, attractive wage rate in off-farm activity, industrialization, government policies, distribution of farm machines through development assistance accelerated the farm mechanization in the country. The use of farm machinery not only depends on economic and policy matters but also social and psychological factors to the acceptance of modern machinery in the farming operation. Labor shortage and high labor wage rate compelled the farmers to accept farm mechanization. Power availability in farming sector increased at 8% rate due to intervention of government policy in mechanized cultivation.Tillage, spraying and rice threshing are almost fully mechanized, however little progression on mechanization were observed in other activities such as weeding, fertilizer application, harvesting and carrying crops. Adoption of mechanized cultivation increased rapidly due to active involvement of public, private, donors and non-government organization. Quality machinery and after sale service are necessary in successful implementation of farm mechanization program. Government intervention plays an important role in promoting farm mechanization. Power tiller, tractor, reaper and combine harvester are imported from Korea, India and China. The growth of manufacturing industry increased rapidly due to increase in market size. Sprayer, applicator, weeder, irrigation pumps and threshers are manufactured locally by using locally available material. Small and fragmented land restricts the farmers to use larger size of farm machinery. Present land tenure system does not permit the easy movement of farm machinery. The important aspect of farm mechanization is to enlargement of land size. Small size of plot decrease the field capacity of the farm machines. Accessibility of farm machinery in farm land is necessary. Government assistance in farming sector should be continued to procure selected farm machinery at farmer’s level, exemption of import tax on some items, disbursement of fund on the machinery research, extension and capacity building. Government should formulate mechanization policy and promotion law on the production, supply and usage of farm machinery. Islam, A. K. M. S. (2018). Status of rice farming mechanization in Bangladesh. Journal of Bioscience and Agriculture Research, 17(01), 1386-1395. Islam, A. K. M. S. “Status of rice farming mechanization in Bangladesh”. Journal of Bioscience and Agriculture Research, 17.01(2018): 1386-1395. Islam, A. K. M. S. (2018) “Status of rice farming mechanization in Bangladesh”. Journal of Bioscience and Agriculture Research, 17 no.01(2018):1386-1395. Blackgram (Vinga mungo L.) is one of the most valued pulses due to its culinary values. It has been able to draw a special attention from the scientist and growers for the intensified and inorganic cropping system of Bangladesh. Use of proper micronutrients in appropriate amount is the key factor of pulse productivity. Therefore, a field experiment was conducted at Sher-e- Bangla Agriculture University, Sher-e- Bangla nagor, Dhaka-1207, Bangladesh from September 2012 to December 2012 to evaluate the performance of blackgram (BARI Mash- 3) influenced by the various levels of Zinc (Zn) and Boron (B) fertilizers. Four levels of Zn (0, 1.25, 2.5 and 3.75 kg ha–1) and five levels of B (0, 0.5, 1.0, 1.5 and 2.0 kg ha–1) were studied in a randomized complete block design with three replications. The results revealed that the single application of Zn=2.50 kg ha–1, B=1.50 kg ha–1 and their combination (Zn2.5 × B1.5 kg ha–1) showed more significant increase in growth characteristics viz. Leaf area index, total dry matter, crop growth rate and relative growth rate of blackgram in this study. The application of these two fertilizers as singly or their interaction would be the most appropriate level for getting the superior growth and yield performance of Blackgram. Cherry tomato is a high value vegetable and demand increased in the market. The study was conducted in the Sher-e-Bangla agriculture university at Horticultural Research Farm, Department of Horticulture, Dhaka, during the period from November 2016 to March 2017. Twelve cherry tomato lines under study, viz., L1, Jhumka-red; L2, Sweetie; L3, Cherry Sweet red; L4, SAU Olive cherry; L5, Chinese; L6, Jhumka-yellow; L7, Clamentine; L8, Golden juble; L9,SAU Black cherry; L10, Whitest; L11, Orange; L12, JP-13. The data obtained for different characters were statistically analyzed by MSTAT-C computer package program. Three randomly selected competitive plants from each cherry tomato line in all plot, and were tagged plants used for recording observed for few characters. The quality of fruits and vegetables can be characterized by attributes such as appearance, flavor, texture, nutritional value and safety. However cherry tomato is a small size and has deferent color and shape, so we have the advantage going our market. Together with these factors arises the issue of how important the knowledge about growth conditions is for preference. This study has result that the highest fruit yield/hectare in L7 (clementine) is attributed to better vegetative growth and quality yield. Rahul, S., Rahman, M. M., Rakibuzzaman, M., Islam, M. N. & Jamal Uddin, A. F. M. (2018). Study on growth and yield characteristics of twelve cherry tomato lines. Journal of Bioscience and Agriculture Research, 17(01), 1403-1409. Rahul, S., Rahman, M. M., Rakibuzzaman, M., Islam, M. N. and Jamal Uddin, A. F. M. “Study on growth and yield characteristics of twelve cherry tomato lines”. Journal of Bioscience and Agriculture Research, 17.01(2018): 1403-1409. Rahul, S., Rahman, M. M., Rakibuzzaman, M., Islam, M. N. and Jamal Uddin, A. F. M. “Study on growth and yield characteristics of twelve cherry tomato lines”. Journal of Bioscience and Agriculture Research, 17no.02(2018): 1403-1409. A field experiment was conducted at the Horticulture Farm, Department of Horticulture, Bangladesh Agricultural University, Mymensingh during the period from March to August, 2016 to investigate the effect of variety and frequency of application of 4-chlorophenoxy acetic acid (4-CPA) on growth and yield of tomato. The experiment was consisted of two factors viz., Factor A: two varieties of summer tomato namely, BARI Hybrid Tomato 4 and BARI Hybrid Tomato 8 and Factor B: frequency of application of 4-CPA i.e., (i) T0 (control) (ii) T1 (at 5 day interval) (iii) T2 (at 10 day interval) and (iv) T3 (at 15 day interval). The concentration of 4-CPA was 60 ppm. The experiment was laid out in randomized complete block design with three replications. The results of the experiment revealed that there were significant variations for most of the characters studied. The higher plant height (91.47 cm) at 75 DAT, flowers per plant (27.22), fruits per plant (9.43), individual fruit weight (84.54 g), fruit weight per plot (7.21) and yield (28.38 t/ha) were found from BARI Hybrid Tomato 4 and the lower for all parameters were found from BARI Hybrid Tomato 8. The maximum plant height (94.45 cm) at 75 DAT, flowers per plant (32.41), fruits per plant (11.41), individual fruit weight (86.89 g), fruit weight per plot (8.92 kg) and yield (35.12 t/ha) were found when 4-CPA applied at 5 day interval whereas the minimum for these characters were recorded from control treatments. In case of combined effect of variety and 4-CPA, the maximum plant height (95.10 cm) at 75 DAT, flowers per plant (33.47), fruits per plant (11.77), individual fruit weight (87.19 g), fruit yield per plot (9.24 kg) and yield (36.36 t/ha)) were observed from BARI Hybrid Tomato 4 when treated with 4-CPA at 5 day interval and the minimum for all these characters were found from BARI Hybrid Tomato 8 at 10 day interval. The results of the present study suggest that application of 60 ppm of 4-CAP at 5 day interval can be practiced for increasing summer tomato production for both the varieties. Key Words: 4-cholorophenoxy acetic acid, plant growth regulator, frequency of application and summer tomato. Roy, B., Alataf-Un-Nahar, M., Sultana, R. & Karim, M. R. (2018). Effects of variety and frequency of application of 4-cholorophenoxy acetic acid on growth and yield of summer tomato. Journal of Bioscience and Agriculture Research, 17(01), 1410-1415. Roy, B., Alataf-Un-Nahar, M., Sultana, R. & Karim, M. R. "Effects of variety and frequency of application of 4-cholorophenoxy acetic acid on growth and yield of summer tomato". Journal of Bioscience and Agriculture Research, 17(01)(2018):, 1410-1415. Roy, B., Alataf-Un-Nahar, M., Sultana, R. & Karim, M. R. "Effects of variety and frequency of application of 4-cholorophenoxy acetic acid on growth and yield of summer tomato". Journal of Bioscience and Agriculture Research, 17no. (01)(2018):, 1410-1415. Biswas, S. K., Islam, S. N., Sarker, M. D. H., Moniruzzaman, M. & Tareq, M. Z (2018). Genetic variability, heritability and genetic advance for yield related characters of tossa jute (Corchorus olitorius) genotypes. Journal of Bioscience and Agriculture Research, 17(01), 1416-1421. Biswas, S. K., Islam, S. N., Sarker, M. D. H., Moniruzzaman, M. and Tareq, M. Z “Genetic variability, heritability and genetic advance for yield related characters of tossa jute (Corchorus olitorius) genotypes”. Journal of Bioscience and Agriculture Research, 17.01(2018): 1416-1421. Biswas, S. K., Islam, S. N., Sarker, M. D. H., Moniruzzaman, M. and Tareq, M. Z “Genetic variability, heritability and genetic advance for yield related characters of tossa jute (Corchorus olitorius) genotypes”. Journal of Bioscience and Agriculture Research, 17 no. 01(2018): 1416-1421. The experiment was conducted in RARS, BARI Hathazari during Robi season in 2014-2015 and 2015-2016 to find out the best variety and best sowing time of mustard under the agro ecological condition of Chittagong region. There were two varieties viz. V1=BARI Sarisha 14 and V1=BARI Sarisha15 and six sowing date viz. S1=10 November, S2=20 November, S3= 30 November, S4=10 December, S5=20 December and S6=30 December. Significant variations due to different sowing time and varieties were observed in days to 50% flowering, days to maturity, plant height, branches plant-1, siliqua plant-1, length of siliqua, seeds siliqua-1, 1000 seeds weight (g), yield plot-1 and yield kg ha-1. Result showed that highest yield was 2083 kg ha-1 obtained from BARI Sarisha15 on 20 November (V2S2) followed by 1667 kg ha-1obtained from BARI Sarisha14 on 20 November (V1S2). From the result it can be concluded that best variety is BARI Sarisha15 and best sowing date is 20 November for Chittagong Region but both varieties can give satisfactory if they are sown from 10 November to 10 December. Azam, M. G., Akter, R., Rahman, M. S., Mahmud, S., Alam, M. R., Faruq, M. O. & Rahman, M. M. (2018). Optimization of sowing time of BARI Sarisha 14 & BARI Sarisha 15 in Chittagong region. Journal of Bioscience and Agriculture Research, 17(02), 1431-1435. Azam, M. G., Akter, R., Rahman, M. S., Mahmud, S., Alam, M. R., Faruq, M. O. and Rahman, M. M. “Optimization of sowing time of BARI Sarisha 14 & BARI Sarisha 15 in Chittagong region”. Journal of Bioscience and Agriculture Research, 17.02(2018): 1431-1435. Azam, M. G., Akter, R., Rahman, M. S., Mahmud, S., Alam, M. R., Faruq, M. O. and Rahman, M. M. “Optimization of sowing time of BARI Sarisha 14 & BARI Sarisha 15 in Chittagong region”. Journal of Bioscience and Agriculture Research, 17 no.02 (2018): 1431-1435. Abstract:​ Ludwigia adscendens (L.) H. Hara is commonly referred as weed which mainly grow in paddy field in the Asia, Australia and Africa. A number of antioxidants present in this species and have a large therapeutic background. To evaluate the analgesic activity of the ethanolic extract of Ludwigia adscendens (L.) H.Hara leaf on Swiss-albino mice (as experimental model) through Acetic Acid Induced Writhing Method. Acute toxicity experiment of the ethanolic extract of Ludwigia adscendens (L.) H.Hara leaf were performed whereby dose of 250 mg/ kg and 500 mg/kg was selected in this present study. Analgesic activity was observed using acetic acid induced writhing pain in mice. Ludwigia adscendens (L.) H. Hara showed Significant (P<0.05) in Extract (250 mg/kg) and (P<0.001) in Extract (500 mg/kg) in this experimental model. These studies conclude that Ludwigia adscendens (L.) H.Hara possesses positive analgesic properties which might be due to presence of antioxidants like flavonoids, phenolics and polysaccharides. The results provide a scientific basis for the centuries-old usages of aqueous extracts of this medicinal plant. HPLC and NMR might help us to specify different biochemical components, responsible for the therapeutic properties precisely. Uddin, A. N. M. S., Murshid, G. M. M., Azad, S. A. & Mazid, M. F. A. (2018). Analgesic effects of ethanolic leaf extract of Ludwigia adscendens (L.) H. Hara over selective drugs in in vivo. Journal of Bioscience and Agriculture Research, 17(02), 1436-1441. Uddin, A. N. M. S., Murshid, G. M. M., Azad, S. A. and Mazid, M. F. A. “Analgesic effects of ethanolic leaf extract of Ludwigia adscendens (L.) H. Hara over selective drugs in in vivo”. Journal of Bioscience and Agriculture Research, 17.02(2018): 1436-1441. Uddin, A. N. M. S., Murshid, G. M. M., Azad, S. A. and Mazid, M. F. A. “Analgesic effects of ethanolic leaf extract of Ludwigia adscendens (L.) H. Hara over selective drugs in in vivo”. Journal of Bioscience and Agriculture Research, 17 no.02(2018): 1436-1441. An experiment was conducted in at Advanced Seed Research and Biotech Center (ASRBC), ACI Limited; Dhaka, Bangladesh during the period of September to October, 2014 to evaluate different growth regulator composition towards shooting from callus produced using the flower bud of selected mother plant of gerbera. Callus grown from flower buds were subjected to six growth regulator composition viz.T0: 0 mg/l BAP + 0 mg /l NAA, T1: 1 mg/l BAP + 0.01 mg /l NAA, T2:2 mg/l BAP + 0.01 mg /l NAA, T3: 3 mg/l BAP + 0.01 mg /l NAA, T4:4 mg/l BAP + 0.01 mg /l NAA, T5:5 mg/l BAP + 0.01 mg /l NAA. Number of responsive explants (34.3), Percent (%) of responsive explants (85.8%), Number of days taken for shoot initiation (16 days), Number of shoots per clump (8.0), Number of leaves per shoot (7.70), Shoot length (25.4 mm) were found best in T3 whereas the lowest was observed from T1 and T5. Thus, combination of 3 mg/l BAP + 0.01 mg /l NAA can be considered as the best composition of growth regulators for shoot multiplication of gerbera callus grown from flower buds. Parvin et al. “Shoot multiplication of gerbera callus grown from flower buds under different growth regulators composition.” Journal of Bioscience and Agriculture Research 17(02) (2018): 1442-1447. Parvin, S., Sabrin, N., Jahan, M. R., Ahmad, H. and Jamal Uddin, A. F. M. (2018). Shoot multiplication of gerbera callus grown from flower buds under different growth regulators composition. Journal of Bioscience and Agriculture Research, 17(02), 1442-1447. Parvin, S., Sabrin, N., Jahan, M. R., Ahmad, H. and Jamal Uddin, A. F. M. “Shoot multiplication of gerbera callus grown from flower buds under different growth regulators composition.” Journal of Bioscience and Agriculture Research 17(02) (2018): 1442-1447. Parvin, S., Sabrin, N., Jahan, M. R., Ahmad, H. and Jamal Uddin, A. F. M. 2018. Shoot multiplication of gerbera callus grown from flower buds under different growth regulators composition. Journal of Bioscience and Agriculture Research, 17(02), pp. 1442-1447. Parvin, S, Sabrin, N, Jahan, MR, Ahmad, H and Jamal Uddin, AFM. Shoot multiplication of gerbera callus grown from flower buds under different growth regulators composition. 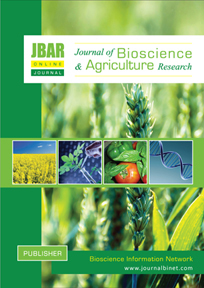 Journal of Bioscience and Agriculture Research. 2018 October 17(02): 1442-1447. With the modernization of agriculture, the role of insecticides has become intensely important and the farmers are mainly exposed to the health risk due to lack of maintaining the proper safety procedure during the pesticide application. The study aims at investigating the present pesticide application practices, farmers’ knowledge and attitude toward pesticide application, identifying the problems regarding pesticide application and proposals for modification. To achieve these objectives a questionnaire survey was conducted in Abdulpur, Jessore and the data were analyzed in IBM SPSS (Statistical Package Software Spreadsheet). Pesticide use in the study area appears to be influenced by the local pesticide sellers and it is found that majority (96%) of the farmers are well aware of the harmful effect of pesticides but contrary to expectations, these do not significantly change their practices or attitude towards safe pesticide use. The survey also revealed that beneficial insects, birds and other animals may have been affected in the study area since the majority (74%) of the interviewees applied the pesticide at low pest densities. Farmers in this study generally demonstrated a poor knowledge of pesticide handling. An important finding of this study is that there are low levels of adoption of protective behaviors to reduce occupational exposure during pesticide application. To improve the situation comprehensive pesticide training program is needed and to reduce farmers’ heavy reliance on pesticides in pest control, IPM (Integrated pest management) strategies should be implemented.